Fifteen minutes later, still at the picnic, Mr. Collins answered Mr. Wilkinson, prosecutors said. “Wow. Makes no sense. How are these results even possible?? 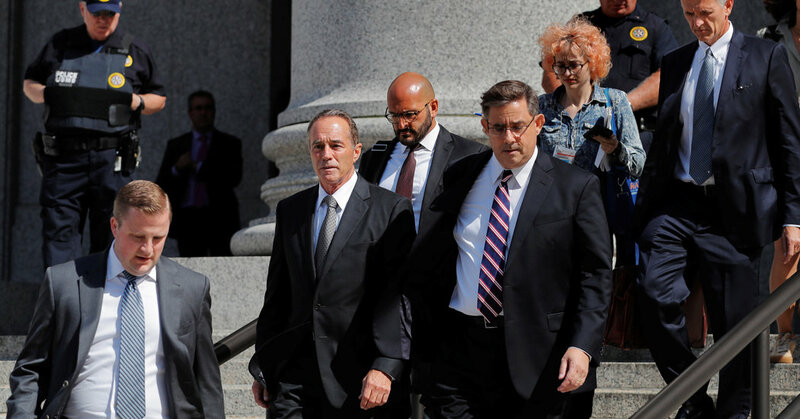 ?,” he wrote Over the next five minutes, phone records included in the indictment show, Mr. Collins called his son, missing him six times before they had a brief conversation. Prosecutors claim that in that conversation he told his son about the unsuccessful drug trial. The following morning, the indictment said, Cameron Collins placed an online order with his brokerage firm, selling more than 16,500 shares of Innate Immunotherapeutic stock. Over the next few days, Mr. Collins, 25, placed 53 more sell orders and passed the tip to others, including his fiancée, Lauren Zarsky, and Ms. Zarsky’s father, Stephen Zarsky, 66. Cameron Collins and Mr. Zarsky were also charged with insider trading and lying to investigations. Acting on the tip from Cameron Collins, Mr. Zarsky avoided about $144,000 in losses. Mr. Zarsky’s wife, daughter and brother also dumped their stock before it dropped in price, though they were not charged, the indictment said. On June 27, 2017, the day after Cameron Collins made his last trades, news of the failed drug test became public and the company’s stock plummeted by more than 90 percent. The congressman did not sell his any of own stock, prosecutors said, because he was already under investigation by the Congressional Ethics Office.